Many nearby galaxies blast huge, wide-angled outpourings of material from their center, ejecting enough gas and dust to build more than a thousand stars the size of our sun every year. Astronomers have sought the driving force behind these massive molecular outflows, and now a team led by University of Maryland scientists has found an answer. A new study in the journal Nature, published March 26, 2015, provides the first observational evidence that a supermassive black hole at the center of a large galaxy can power these huge molecular outflows from deep inside the galaxy’s core. These outflows remove massive quantities of star-making gas, thus influencing the size, shape and overall fate of the host galaxy. 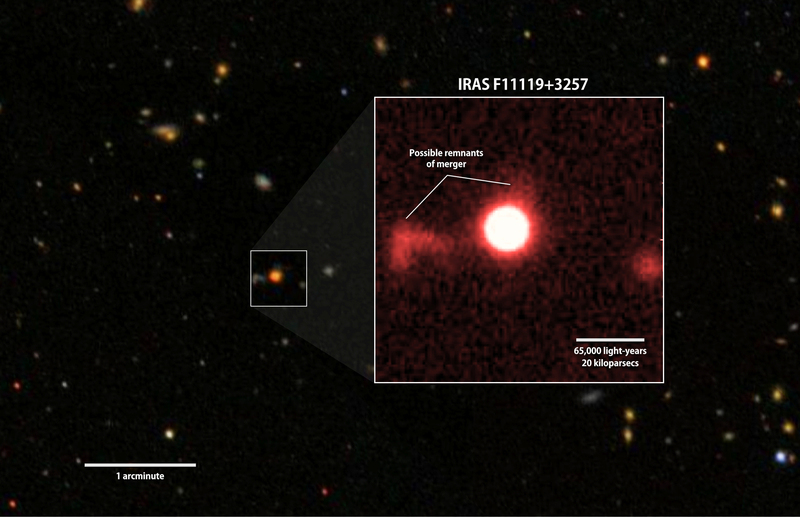 The galaxy highlighted in the study, known as IRAS F11119+3257, has an actively growing supermassive black hole at its center. This means that, unlike the large black hole at the center of our own Milky Way galaxy, this black hole is actively consuming large amounts of gas. As material enters the black hole, it creates friction, which in turn gives off electromagnetic radiation—including X-rays and visible light. Black holes that fit this description are called active galactic nuclei (AGN), and their intense radiation output also generates powerful winds that force material away from the galactic center. The study found that these AGN winds are powerful enough to drive the large molecular outflows that reach to the edges of the galaxy’s borders. Although theorists have suspected a connection between AGN winds and molecular outflows, the current study is the first to confirm the connection with observational evidence. “This is the first galaxy in which we can see both the wind from the active galactic nucleus and the large-scale outflow of molecular gas at the same time,” said lead author Francesco Tombesi, an assistant research scientist in UMD’s astronomy department who has a joint appointment at NASA’s Goddard Space Flight Center via the Center for Research and Exploration in Space Science and Technology. The team analyzed data collected in 2013 by Suzaku, an X-ray satellite operated by the Japan Aerospace Exploration Agency (JAXA) and NASA, as well as data from the European Space Agency’s Herschel Space Observatory. While many previous studies independently described AGN winds and molecular outflows in separate galaxies, Tombesi and his colleagues needed to find a galaxy in which they could see both at the same time. IRAS F11119+3257 turned out to be a perfect candidate. An alternate theory says that active star formation near the galactic center could drive molecular outflows. However, the brightness of IRAS F11119+3257’s active nucleus—which is responsible for about 80 percent of the galaxy’s overall radiation—suggested otherwise. Star formation alone cannot explain this intense concentration of energy, leading the researchers to conclude that the AGN winds must be the primary driver. “The temptation is to ignore the supermassive black hole when studying galactic dynamics and evolution, but our study shows that you can’t because it influences galaxies on the larger scale,” said Marcio Meléndez, a research associate in UMD’s astronomy department and a co-author of the study. Limited satellite time means that, at least for now, the team has only this one galaxy as a baseline for study. But now that they have a better idea what they are looking for, they will be able to find more candidate galaxies in the future. Within the next year, JAXA and NASA will launch ASTRO-H, a successor satellite to Suzaku. The instruments aboard ASTRO-H will make it possible to study more galaxies like IRAS F11119+3257 in greater detail. In addition to Tombesi, Meléndez and Veilleux, study authors included UMD astronomy professor and JSI fellow Chris Reynolds; James Reeves of Keele University in the United Kingdom; and Eduardo González-Alfonso of the Universidad de Alcalá in Spain. This research was supported by NASA (Award Nos. NNX12AH40G, NNX14AF86G, NHSC/JPL RSA grants 1427277 and 1454738), the U.S. National Science Foundation (Award Nos. AST1333514 and AST1009583), the Spanish Ministerio de Economía y Competitividad (Award Nos. AYA2010-21697-C05-0 and FIS2012-39162-C06-01) and the U.K. Science and Technology Facilities Council. The content of this article does not necessarily reflect the views of these organizations. 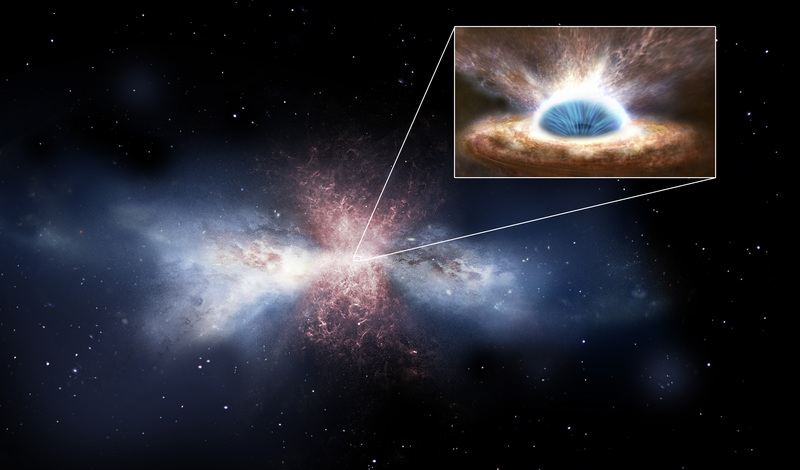 The research paper, “Wind from the black hole accretion disk driving a molecular outflow in an active galaxy,” Francesco Tombesi, Marcio Meléndez, Sylvain Veilleux, James Reeves, Eduardo González-Alfonso and Chris S. Reynolds, was published on March 26, 2015, in the journal Nature.